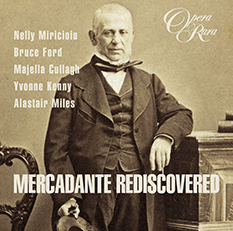 To celebrate twenty-five years of recording the worlds rarest operas, Opera Rara presents a condensed version of its acclaimed survey of opera in the first half of the 19th century. 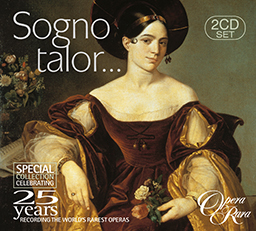 To celebrate twenty-five years of recording the worlds rarest operas, Opera Rara presents a condensed version of its acclaimed survey of opera in the first half of the 19th century. The double CD set is in the form of a two-act Grand Opera Gala, with an overture, choruses, arias, ensembles and extravagant finales. The operatic selections take you from the quartet in Zingarelli’s 1801 Ines de Castro to the berceuse from Meyerbeer’s Dinorah written in 1856. In the intervening fifty years are found further riches by Rossini, Donizetti, Mercadante and Pacini as well as Mayr, Ricci and Winter. A total of 9 composers guide you through the early development of the bel canto school of singing. Includes song texts with English translation for each track. 05 Adelasia e Aleramo, Act I: Trio: Dove salvarmi? Oh Dio! 06 Rosmonda d’Inghilterra, Act II: Duet: Giurasti un di? rammentalo? 12 Ricciardo e Zoraide, Act I: Trio: Cruda sorte! 15 Dinorah, “Le pardon de Ploermel”, Act I: Bellah! Ma chèvre cherie! 16 Elisabetta al castello di Kenilworth: Quartet: Freme! ondeggia irresoluto! 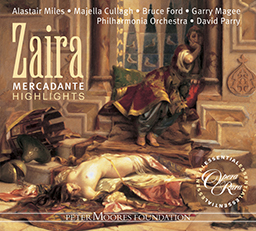 17 Zaira, Act I: Cavatina: Liete voci! bei voti! 19 Ines de Castro: scena and Aria: Non paventar mia vita! 24 Orazi e Curiazi, Act I: Addio! 25 Le pont des soupirs: Aria: Ah! qu’il etait doux mon beau reve!